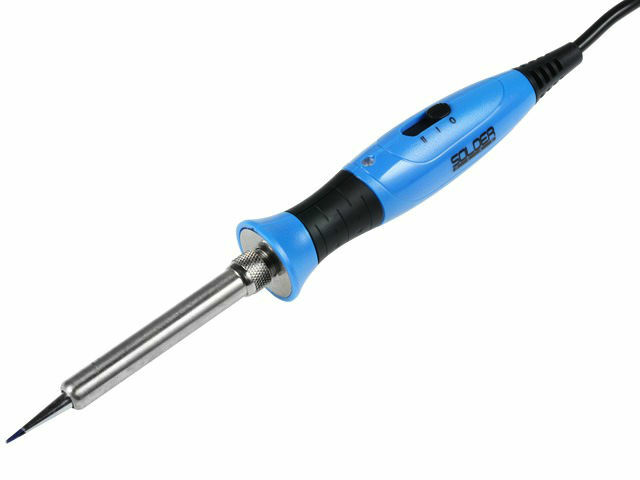 SP-2345 Soldering iron by SOLDER PEAK is ideal for through-hole soldering of electronic components, wires and other simple soldering work. It is equipped with a 23/45W power switch, which allows the selection of soldering parameters to the current work executed. Setting the switch to position "0" allows you to disable the soldering iron without the need to disconnect the plug from the socket. Two Longlife tips are available for the SP-2345 soldering iron: 1mm cone type (included in the kit) and 2.5 x 1mm chisel type. Fastening the tip through the locking sleeve, compared to a typical screw fastening ensures a quick and easy exchange of tips, stable connection and better heat transfer.